Before heading to the Muse concert with my friends (which was BEYOND EXCELLENT by the way), we hung out at Frank and Nic's West End Grille for some dinner and drinks in the bar area. It was Happy Hour (Mon-Fri, 5-7PM) so I got a $5 House Cabernet which was surprisingly smooth. To start, we ordered a plate of sweet chili wings and a plate of traditional wings for the Happy Hour price of $5 each. Both varieties of the wings were very good, I especially liked the sweet chili wings. At first I thought $5 for 7 wings at a Happy Hour price was slightly lame, but the wings are sizeable enough that you don't mind while you eat them. 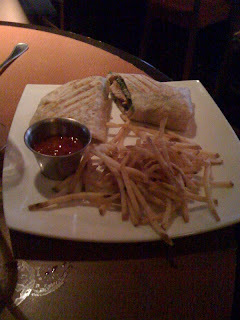 For dinner I ordered the Grilled Chicken Caesar Wrap ($8) which came with shoestring fries (which i LOVE). Now this is where the disappointment set in. Not only did they take an unreasonable amount of time to bring out our food, everyone at the table had a mediocre experience with their meal. I felt like my wrap consisted of charred chicken and romaine - I tasted no caesar dressing whatsoever and it felt incredibly plain to me. Dan ordered a Philly Cheesesteak ($8) and he recieved ONE long caramelized onion slice that ran the length of the sandwich, a meagre porrtion of meat and an invisible amount of cheese. My friend Aaron took about 3 bites of his Cheeseburger ($8) said it was "eh" and left the rest. The only thing we all collectively liked were the fries. What a disappointment! I mean, don't get me wrong, the prices are very good for what we got (I guess), but I would have much rather popped over to Potbelly's next door and had a sandwich for less that I would have been 100% satisfied with. Would I come here again for Happy Hour though? Sure, I wouldn't be opposed to that, but I would leave before dinnertime. Has anyone ever been and sat at the dining room side of this place and had a different experience? ?